The Tiny Love Tiny Princess take along mobile is a fun, colorful mobile that can travel everywhere you and your baby go. It’s the perfect pink for your little princess, featuring five soothing melodies and adorable characters to keep your baby relaxed and entertained, the engaging mobile secures with a simple snap to most pack-and-plays, car seats, and strollers. 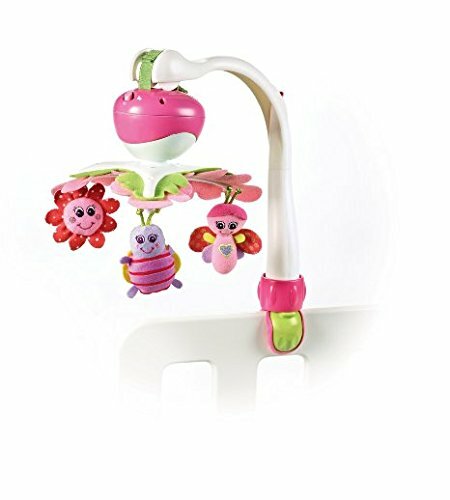 Parents and children will enjoy the sense of familiarity the tiny princess take along mobile brings.The TINY LOVE Tiny Princess Take Along Mobile is a fun, engaging toy that can travel everywhere you and your princess go. Featuring five soothing melodies and pretty-in-pink colors to keep your baby relaxed and entertained, the mobile secures with a simple snap to most pack-and-plays, car seats, and strollers. Parents and children will enjoy the sense of familiarity the Take Along Mobile brings when they’re away from home. Each of the three plush hanging toys features engaging designs and colors that will soothe and delight your child. View larger. 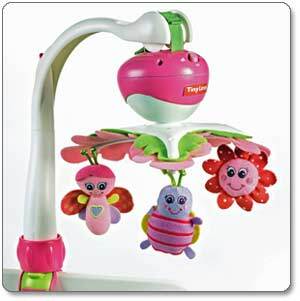 Combining music and motion, the Tiny Princess Take Along Mobile features a trio of soft, rotating toy, including a butterfly, a flower, and a bumblebee. The mobile has 30 minutes of music with five different melodies to choose from. 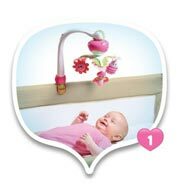 This mobile quickly becomes a familiar toy and will provide a sense of continuity wherever you and your baby go. 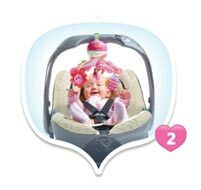 The Tiny Princess Take Along Mobile secures with a simple snap to most pack-and-play sets, infant carriers, strollers, and bassinets. 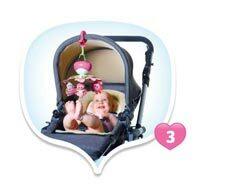 Three connectors are included, each specific to your baby’s location: a clamp for attaching to the sides of pack-and-play sets, a clip for the canopy of a stroller, and a strap for the handle of an infant carrier. The Take Along Mobile can also clamp or clip to most bassinets. This versatile design means you can keep your baby entertained and soothed as you move throughout the day. The Tiny Princess Take Along Mobile’s host of sounds form musical “sentences” that stimulate your baby’s linguistic faculties. The colors, contrasting textures, and moving parts enrich babies’ visual experiences, helping them learn to focus on objects and track movement with their eyes. Trusted by parents worldwide, TINY LOVE creates toys and products for babies by pairing breakthroughs in child development with quality materials and design. Each product is crafted after consultation with child development experts, quality assurance specialists, and parents. TINY LOVE is passionate about providing parents and caregivers with resources to better a child’s early development. For example, the TINY LOVE Developmental Center is a virtual space to share knowledge about child development. Also, TINY LOVE’s 7 Elements System categorizes the specific facets of a baby’s development that are at the heart of each TINY LOVE product. Committed to excellence, all of TINY LOVE’s products meet the standards of the American Society for Testing and Materials (ASTM), the Code of Federal Regulations (CFR) of the Consumer Product Safety Commission (CPSC), and the European EN-71 (CE) standards. TINY LOVE Tiny Princess Take Along Mobile and instruction guide. Fits most pack and plays or travel cots, car seats, strollers, and bassinets. BEST PURCHASES EVER! Picked this mobile up while trying to hunt for a deal on a mobile since we didnt want to spend a lot on something baby was going to use for only a few mos so we found this little gem. Great mobile, pleasantly surprised! After reading the reviews I was hesitant and purchasing this… But I figured for 20 bucks I couldn’t go wrong.